Difference between revisions of "Iptables"
iptables is used to inspect, modify, forward, redirect, and/or drop IP packets. The code for filtering IP packets is already built into the kernel and is organized into a collection of ''tables'', each with a specific purpose. 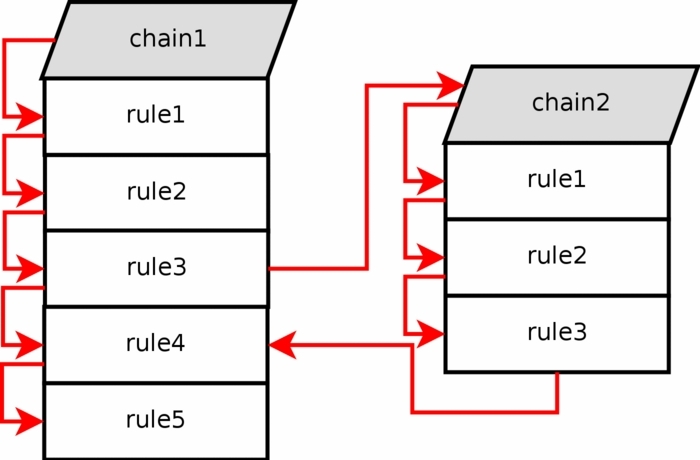 The tables are made up of a set of predefined ''chains'', and the chains contain rules which are traversed in order. Each rule consists of a predicate of potential matches and a corresponding action (called a ''target'') which is executed if the predicate is true; i.e. the conditions are matched. iptables is the user utility which allows you to work with these chains/rules. Most new users find the complexities of linux IP routing quite daunting, but, in practice, the most common use cases (NAT and/or basic Internet firewall) are considerably less complex. The key to understanding how iptables works is [http://www.frozentux.net/iptables-tutorial/images/tables_traverse.jpg this chart]. The lowercase word on top is the table and the upper case word below is the chain. Every IP packet that comes in ''on any network interface'' passes through this flow chart from top to bottom. A common source of confusion is that packets entering from, say, an internal interface are handled differently than packets from an Internet-facing interface. All interfaces are handled the same way; it's up to you to define rules that treat them differently. 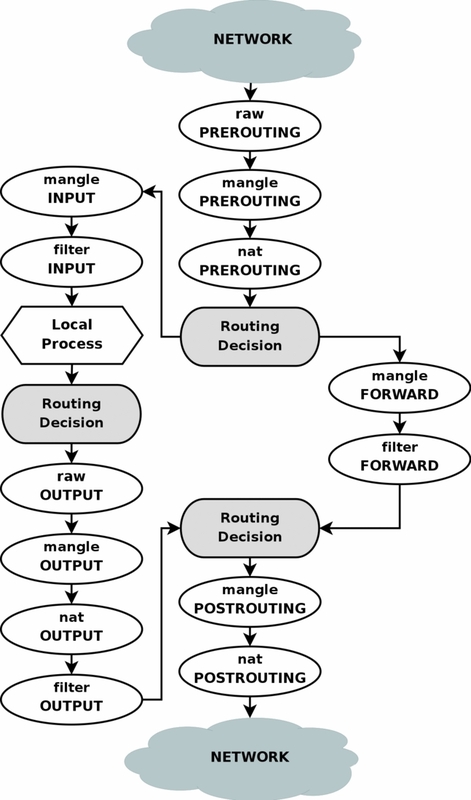 Of course some packets are intended for local processes, hence come in from the top of the chart and stop at <Local Process>, while other packets are generated by local processes; hence start at <Local Process> and proceed downward through the flowchart. A detailed explanation of how this flow chart works can be found [http://www.frozentux.net/iptables-tutorial/iptables-tutorial.html#TRAVERSINGOFTABLES here]. The key to understanding how iptables works is [https://www.frozentux.net/iptables-tutorial/images/tables_traverse.jpg this chart]. The lowercase word on top is the table and the upper case word below is the chain. Every IP packet that comes in ''on any network interface'' passes through this flow chart from top to bottom. A common source of confusion is that packets entering from, say, an internal interface are handled differently than packets from an Internet-facing interface. All interfaces are handled the same way; it's up to you to define rules that treat them differently. Of course some packets are intended for local processes, hence come in from the top of the chart and stop at <Local Process>, while other packets are generated by local processes; hence start at <Local Process> and proceed downward through the flowchart. A detailed explanation of how this flow chart works can be found [https://www.frozentux.net/iptables-tutorial/iptables-tutorial.html#TRAVERSINGOFTABLES here]. nftables was released in release with Linux kernel 3.13, and will one day replace iptables as the main Linux firewall utility.